In creating the 5 Vegas Series A cigar, a dark and toothy maduro wrapper from Costa Rica is hand-wrapped around a carefully balanced 3-nation blend of 4-year-aged long-fillers before the finished cigars are given a lengthy 6-month nap to ensure immaculate smoothness. All that work, just so you can go ahead and set these delicious bad boys on fire. 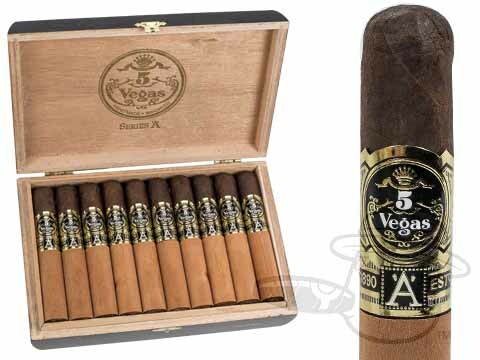 Medium-full in body, the 5 Vegas Series A qualifies as a true “flavor-bomb,”offering up spicy and savory tones of earth, coffee, and dark chocolate with a long, sweet finish. Factor in its clean and easy burn and excellent, cedar-sleeved presentation, and you’ll see that we’re firing on all cylinders here. Now look at the price. I’ll shut up so you can complete your order in peace. 5 Vegas Series A Artisan is rated 4.2 out of 5 based on 1 customer ratings.